The Dane County Farmers’ Market in Madison, WI, is a treasure trove of culinary delights. Madison may just be the perfect place for a farmers’ market – centrally located for local farmers, a populous which appreciates locally harvested, organic foods, and a setting on the Capitol Square. For those of you who have not had the pleasure to visit Madison, the Wisconsin state capitol building is a classically beautiful, white granite clad structure, topped by the largest granite dome in the world, located in the center of an isthmus created by two pristine lakes, surrounded by lawns, walkways, and sculptures. The greater area around Madison includes the Driftless region, an area untouched by glacial flows, which boasts many farms and more than a dozen artisan cheesemakers. The setting helps explain why the Dane County Farmers’ Market is the largest producer-only farmers’ market in the country. The farmers, bakers, cheese-makers are likely to be the one behind the table, handing you your new favorite culinary discovery. A recent trip produced more than the usual number of treats, but the highlight was a few offerings from Bleu Mont Dairy. Willi Lehner has received many national accolades for his bandaged cheddar, made from locally produced milk, wrapped and smeared with lard, then aged on cedar shelves in a cave he built into the hillside. This is old-school cheese making folks. And he can also yodel like a boss. Willi Lehner Yodels at American Cheese Society from Colleen | GlassBottle on Vimeo. Our cheese plate also included a hearty Five Grain Sourdough bread from Madison Sourdough, slices of apple, and a quick apple chutney. The apple, a golden russet variety from the market called Ashmead Kernel, has a texture which veers toward Asian Pear and a tartness which mellows out to a honey sweetness. 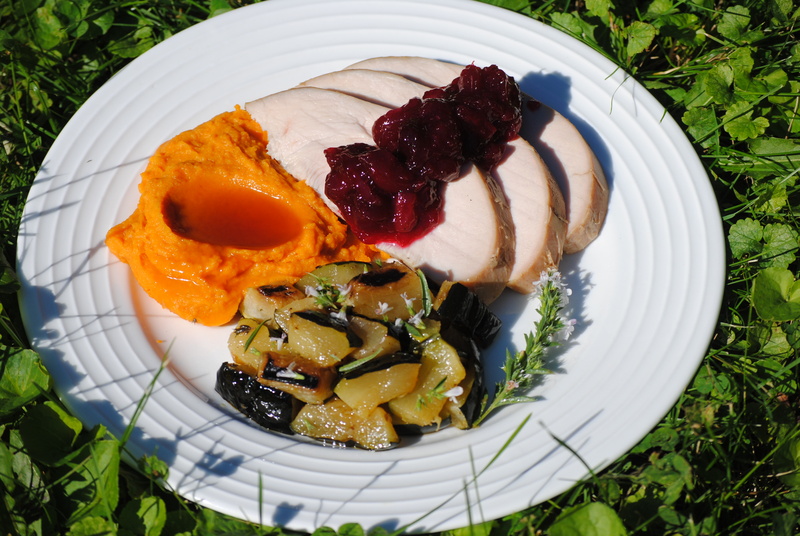 The apple chutney was prepared with onions caramelized with thyme, unsweetened cranberries from Honestly Cranberry, several varieties of apple and a dash of cinnamon and cloves. The Tomme starts with a toasted bread aroma and blends into the grassy/herbaceous/dry straw nuances of sheep milk but a more caramelized finish than many sheep milk cheeses we’ve enjoyed. The texture of the Alpine Renegade is smooth with small holes rather than grainy and the flavor strikes me as starting with cooked milk solids (you know those bits of cheddar that ooze out of the grilled cheese and get crunchy in the pan? Like those smell) and then melts into a wonderfully funky and long lasting finish. This Renegade is no wilting flower, providing a lovely counter-point to the tart sweetness of the apple and the sour punch of the cranberry in the chutney. Some cheeses might get overpowered by the pronounced flavors of the chutney and fade into background notes – this cheese demands equal billing. The lovely bandaged cheddar from Bleu Mont Dairy is often available for shipment from Fromagination in Madison and will also sing beautifully with this combination of flavors. But if you can find the time some fall Saturday morning, the drive to Madison to find Bleu Mont Dairy on the square is well worth the trip. Who knows, maybe you’ll get a chance to hear Willi yodel. 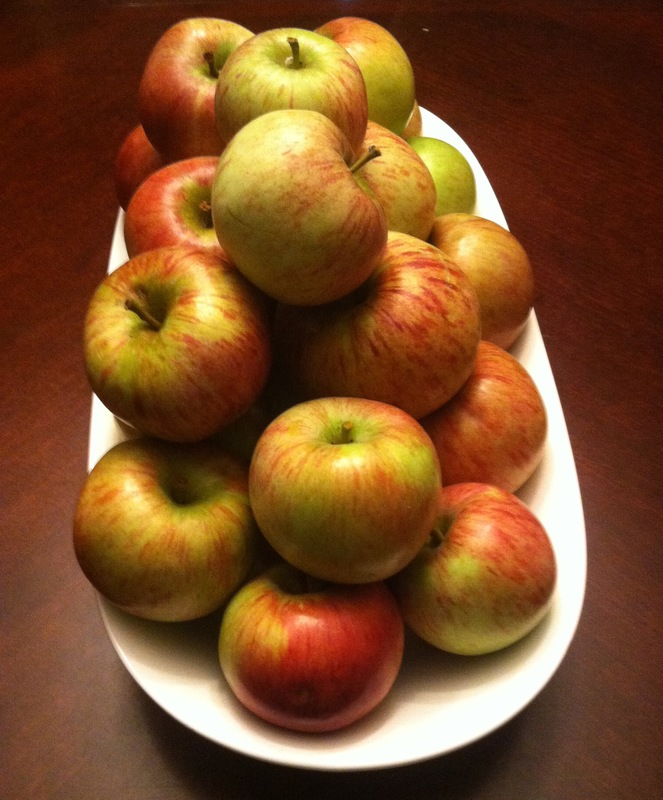 The find of our autumn trip to the apple orchard was a bountiful crop of Pippins. As one of the varietals in an apple pie it has the advantages of enormous size (which cuts down significantly on peeling and coring! 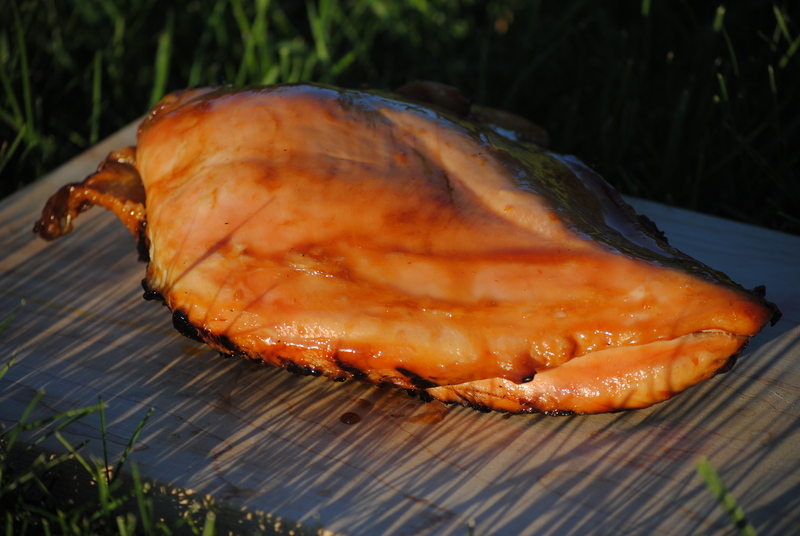 ), a tart flavor, and a surprising ability to hold shape through the cooking process. If you can’t find Pippins, Honey Crisps will work as well which were in abundance for our next trip. Our end goal was to recreate the amazing hand pies we stumbled upon in an early morning trip to the farmers market in Sheboygan, WI. These beauties were made by an Amish baker and I suspect the flaky crust may have been from the use of lard rather than just butter. I swear to you, the crust was as good as the filling. My daughter and I sat looking out on Lake Michigan in the warming glow of the early autumn sun and ate them as breakfast. Mix the diced apples with the sugar and cinnamon and allow to marinate in the refrigerator for a few hours. Remove apples from the refrigerator. Pre-heat the oven to 375 degrees. Place the apples into a 9 inch baking pan. 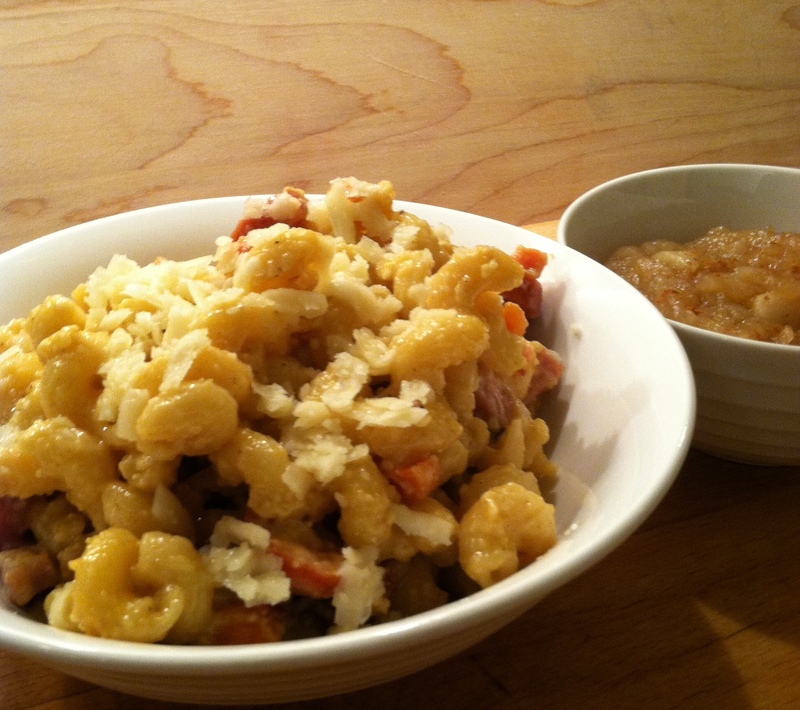 In a separate bowl, mix all remaining ingredients and mix until just crumbled together, then spread over apple mixture. Bake for 50 minutes or until apples are tender and mixture bubbles at the edges. Allow to cool for 15 minutes before serving. We enjoyed this as dessert with a scoop of vanilla ice cream and house-made caramel sauce. But with a nice cup of coffee, it would make a lovely breakfast as well. Particularly if you can enjoy it looking out over a lake as the autumn sun rises. Check our our previous apple post here. 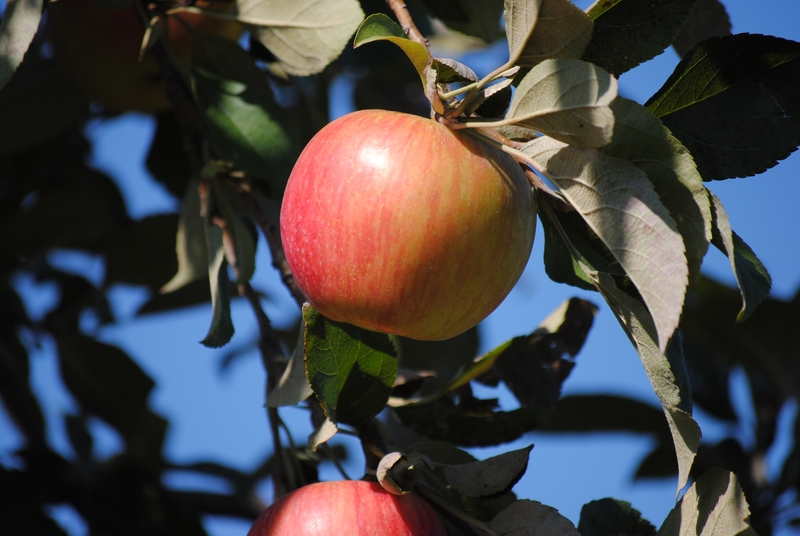 A recent piece by James Norton over at HeavyTable on the “Noble Farce” of the modern apple orchard inspired me to comment here on our autumn ritual of visiting the folks at Barthel Fruit Farm in Mequon, WI. If you haven’t read the blog, articles, and books by Mr. Norton over at HeavyTable, you are missing out. Please go read them now. He proposes a 10-point scale for the modern apple orchard which try ever so nobly to generate a profit from a seasonal influx of city dwellers. His scale is for the level of “farce” involved: a full 10 is essentially an apple-themed amusement park and a 1 is just trees in a field. He opts for the farm with at least a corn maze and apple-cider doughnuts, something like a 7 on his scale. I can respect that, but for me and mine, I’ll take something a bit closer to a 2 or 3 on the scale. Rolling hills, rows of many different apple varietals, a pumpkin field, and fresh pressed cider in the lower level of the barn. I lean rustic. Making the annual visit with the family obviously adds to my fondness for the excursion. Barthels allows cars to drive into the orchard on a gravel road to park close to the trees that are available for picking at the time. We timed our visit for the Honeycrisp apples, which pairs very nicely with an aged cheddar or perhaps with a creamy blue cheese in a salad with walnuts. We also picked a bushel of Cortland apples, which are great for applesauce and apple pie. The day was one of those “warm for fall” sort of days, when you are hot when the sun is beating down on you, but can get suddenly chilled in the shade with just a slight breeze. A fall day that reminds you the summer is coming to a close. The geese fly in formation south, calling loudly, bon voyage. We are left behind to hunker down, eat well, and prepare for the cold months ahead. With our bounty of apples, we turned our efforts to a batch of applesauce – simply peeled and cored, cut into large dice and then simmered with a splash of apple cider. We add brown sugar and/or apple cider vinegar to balance the sweetness or the “tanginess” to the desired level and then add cinnamon and a bit of powdered clove, sometimes a bit of nutmeg, allspice, the standard autumn spices. A potato masher breaks the apples down to a nice texture, a hand blender would create something more like store-bought. I like a little texture – like I said, I lean rustic. I like it warm, with a scoop of vanilla ice cream, light sprinkle of powdered clove. The whole experience – walking the fields, picking the apples, enjoying a cider or a caramel apple in the barn, peeling the apples with the kids, patiently waiting for the applesauce to break down to the perfect flavor and texture, and then enjoying it with the cool contrast of ice cream – the whole experience is part of our fall ritual. And it is part of what it means to live in the Great Lakes region – bountiful harvest, changing seasons, hunkering down, together. Heat oven to 350 degrees. Line baking sheet with parchment paper. Pour maple syrup into a small bowl and drag bacon slices through syrup and place on baking sheet. Bake for 8 minutes, flip and season with barbeque seasoning. Bake an additional 8 minutes or until crisp. Watch carefully in the final few minutes to avoid burning. Set aside to cool. In a large saucepan over medium heat, place 1 tablespoon of butter, onion, carrot, ham and wieners until vegetables are softened. Remove from heat, and stir in the remaining butter, milk, eggs, and cheeses. Stir in the pasta. Heat oven to 350 degrees. Fill 13×9 pan with pasta mixture. Bake for 25 minutes or until the egg mixture sets. While the pasta bakes, cut the bacon into crumbles. 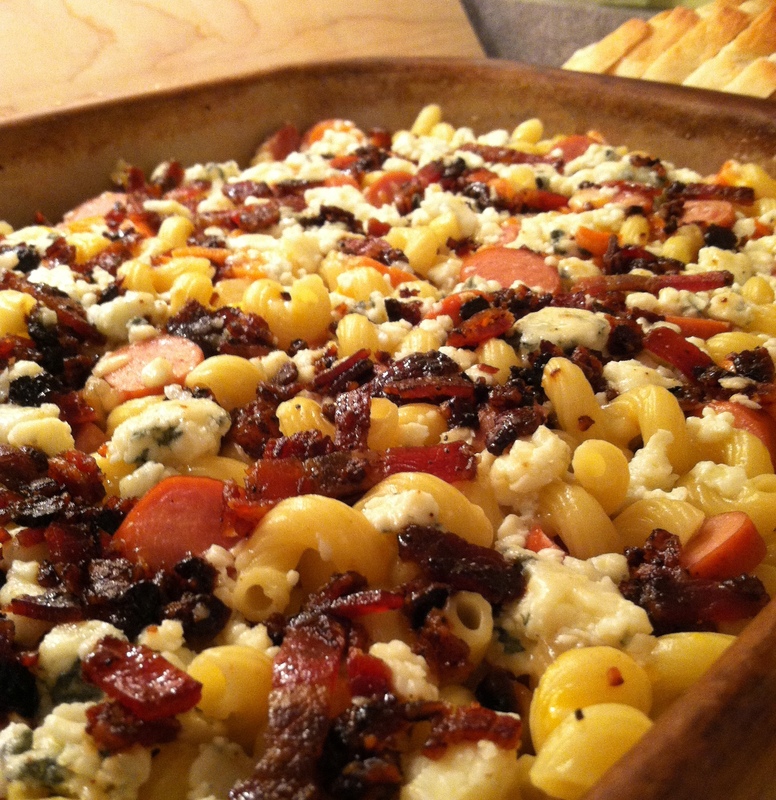 Serve with crumbled bacon. We enjoyed this with a side of home made apple sauce, with apples picked at a local orchard. 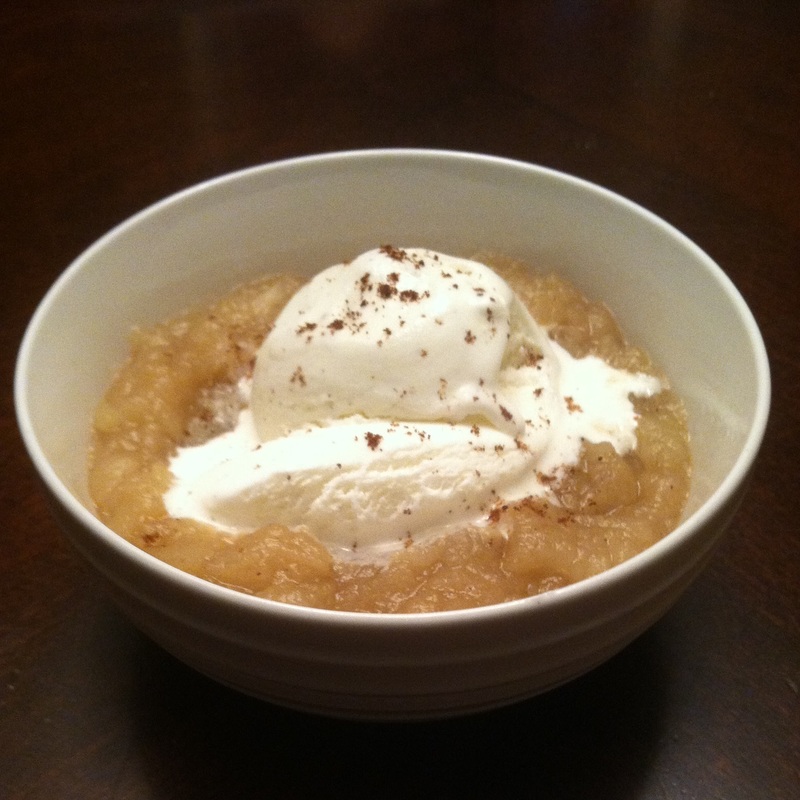 Our apple sauce included 2 each of Pippin, McIntosh, and Cortlands, peeled and cored then cooked in a medium sauce pan over medium each with 1 cup water, ½ cup brown sugar, ½ teaspoon ground cinnamon, and ¼ teaspoon ground cloves. Cooked for 10-15 minutes until it reaches your desired consistency. This was a fun twist on the classic combination of cheddar and apple. We’re big fan’s of Nueske’s meats, which we’ve covered before, so it is no surprise that all the meats in the dish were Nueske’s. The white cheddar we used was 6 year aged and the blue cheese was from Black River. Very rich, smoky flavors. Really enjoyed this with a Staghorn Oktoberfest from New Glarus Brewing. Yes, that was birthday worthy.